C-GCDX landing at Sioux Lookout - CYXL, Ontario. • 58-1700 US Army. Delivered 03-Feb-1959. Designated as U-1A. Assigned initially to 17th Aviation Company, Fort Ord, CA. Jun-1964. Otter Transition School, Fort Ord, CA. Feb-1966 Unknown Unit and Location. Nov-1968.16th Combat Aviation Group, Chu LaiVietnam. Aug-1969. 142nd Transportation Company, Da Nang, Vietnam. Jan-1970 Sharpe Army Depot, Stockton, CA. Feb-1973. Deleted from Army Inventory and put up for sale. • No regn Laurentian Air Services Ltd., Ottawa. Purchased 08-Jan 1974. • No regn Sold to Ag-Air Company, Latah, WA., for restoration. No other details known. • C-GCDX Nipawin Air Services Ltd., Nipawin, SK. Temp. Regd 24-Jun-1974 for import. Formal regd 15-Jul-1974. Accident. Otter Lake, SK. 04-May-1978. When landing on a strip 2,500 feet long and 75 feet wide, directional control was not maintained after the tailwheel touched down on the landing roll. The Otter veered off the runway and down an embankment. Considerable damage was caused and two of the three on board sustained minor injuries. • C-GCDX Bearskin Lake Air Service, Big Trout Lake, ON, Regd Circa1980. Canx 26-Aug-1986. • C-GCDX Allen Airways Ltd., Sioux Lookout, ON. Regd 30-Aug-1993. Canx 04-Jul-1996. • C-GCDX Enterlake Air Services Ltd., dba Selkirk Air, Selkirk. MB. Regd 04-Jul-1976. Canx & deleted 22-May-2008 on export to USA. Accident: McDowell, Ontario. 15-Mar-1982. The pilot was flying circuits and landings in an attempt to pack the snow on a ski-strip. On the fifth landing, the left ski link bracket failed and the aircraft settled onto the left wing. Power plant: Re-engined by Selkirk with a Polish PZL ASZ-621R-M18. 1000hp. Motor. Accident: Wrong Lake, MB. 30-Jun-2001.The aircraft was started up and pushed away from the dock. A gust of wind swung the aircraft around and the pilot applied engine power to try to compensate. The combined engine power and wind pushed the aircraft into trees and rocks, causing damage to the right float, right wing tip and propeller. • N413JP Bald Mountain Air Service Inc., Homer AK. Regd 23-May-2008. Otter 314 was delivered to the United States Army on 3 February 1959 with serial 58-1700 (tail number 81700). It was assigned to the 17th Aviation Company at Fort Ord, California until June 1964, when it joined the Otter Transition School, also based at Fort Ord. The School trained pilots on the Otter for service in Vietnam. In February 1966 it was assigned to another unit (Unit Identification Code WC02AA, identity unknown) and served with that unit until November 1968, when it was transferred to the 16th Combat Aviation Group in Vietnam. The Otter, and a Beaver, flew for the Group Headquarters, based at Chu Lai. It continued with this tasking until August 1969, when it was taken on charge by the 142nd Transportation Company, Da Nang and prepared for shipment home. It arrived at the Sharpe Army Depot, Stockton, California in January 1970 and was stored there until February 1973, when it was deleted from the Army inventory and put up for disposal as military surplus. It had flown 3,595 hours in Army service. 81700 was one of seven Otters sold at a DPDO Auction at Stockton on 8 January 1974, of which four were bought by Laurentian Air Services Ltd., of Ottawa. These four were 76108 (226), 81700 (314), 81704 (316) and 92210 (348). The purchase price for 81700 was $6,500. Of the four, Laurentian Air Services flew two of them (226 and 348) to their base at Ottawa, restored them to civilian configuration and put them into service. The other two (314 and 316) were not in flyable condition and they were immediately sold on to Ag Air Company of Latah, Washington, who collected the two Otters at Stockton and brought them by truck to Latah. There they restored 314 to flying condition and then sold it to Nipawin Air Services Ltd., Nipawin, Saskatchewan. A temporary Certificate of Registration as C-GCDX and flight permit was issued on 24 June 1974 to Nipawin Air Services, to allow for the importation of the Otter into Canada from Latah, and it was then formally registered to Nipawin Air Services on 15 July 1974. The company provided the usual range of bush services around Saskatchewan, mostly flying hunters and fishermen during the summer months. C-GCDX was to fly for Nipawin Air Services for nearly four years. Its career with the airline came to an end on 4 May 1978 when it crashed at Otter Lake, Saskatchewan, landing on a strip 2,500 feet long by 75 feet wide. Directional control was not maintained after the tailwheel touched down on the landing roll. The Otter veered off the runway and down an embankment. Considerable damage was caused and two of the three on board sustained minor injuries. After repair the Otter was sold to Bearskin Lake Air Service of Big Trout Lake, Ontario to whom it was registered in 1980. This operator had been established by bush pilot John Hegland, based at Big Trout Lake, but named after Bearskin Lake where Hegland had a general store. The Otter was used to provide charter service to remote First Nations reserves in Northwestern Ontario, on floats in summer and wheel-skis in winter. The company also flew Otter C-FAPR (31). While flying for Bearskin Lake Air Service, Otter CDX recorded an incident on 15 March 1982 at McDowell, Ontario. The pilot was flying circuits and landings in an attempt to pack the snow on a ski-strip. On the fifth landing the left ski link bracket failed and the aircraft settled onto the left wing. The damage was repaired and CDX continued in service with Bearskin Lake Air Service. 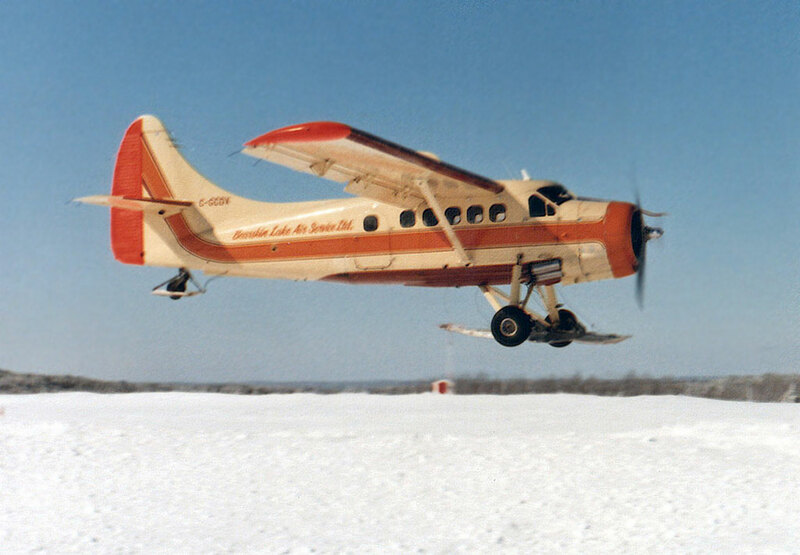 Early in 1986 Otter CDX was at Sioux Lookout, Ontario which was another base of Bearskin Lake Air Service, where it was receiving maintenance. The engine had been removed and the Otter was outside the hangar while the engine was overhauled. A severe windstorm struck the airfield and the Otter was blown into the bush, receiving substantial damage. Its registration to Bearskin Lake A/S was cancelled on 26 August 1986 and it would never fly for that company again. The damaged aircraft was purchased by Allen Airways Ltd., of Sioux Lookout, who were a maintenance provider and also operated some Cessnas on charter work. The Otter went into their hangar at Sioux Lookout for a slow rebuild, which took some years. 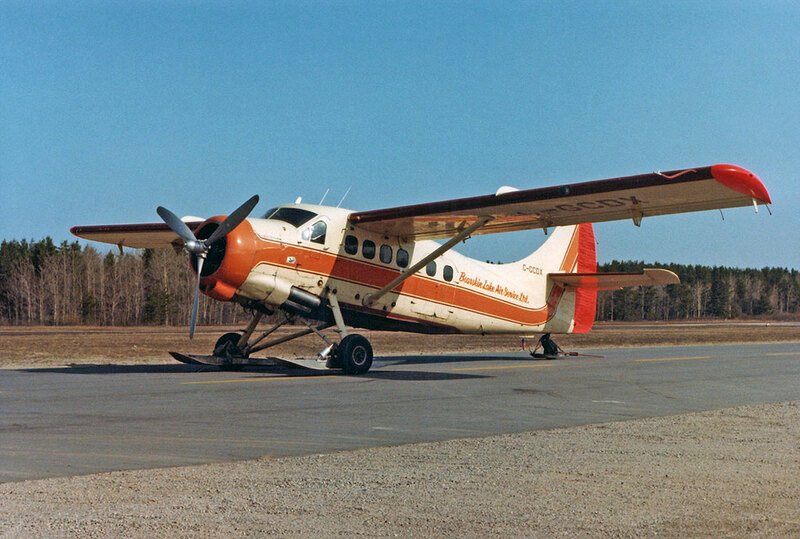 On completion of the rebuild it was registered to Allen Airways Ltd., in August 1993, who retained the Otter for a time until it was sold to Enterlake Air Service Ltd., trading as Selkirk Air of Selkirk, Manitoba to whom it was registered on 4 July 1996. Selkirk Air bought a conversion kit from Airtech Canada and converted Otter CDX with the PZL-1000 engine at their hangar at Selkirk, and it entered service with Selkirk Air. It would fly for this company for the next twelve years, providing the usual range of bush services around norther Manitoba. It joined Selkirk Air’s fleet of a pair of Beavers, some single Cessnas and Otter C-GGSL (166), which had also been converted with the Polish PZL engine. Only one incident was recorded during the Otter’s service with Selkirk Air. On 30 June 2001 at Wrong Lake, Manitoba CDX was started up and pushed away from the dock. A gust of wind swung the aircraft around and the pilot applied engine power to try to compensate. The combined engine power and wind pushed the aircraft into trees and rocks, causing damage to the right float, right wing and propeller. The damage was repaired and CDX continued in service with Selkirk Air. 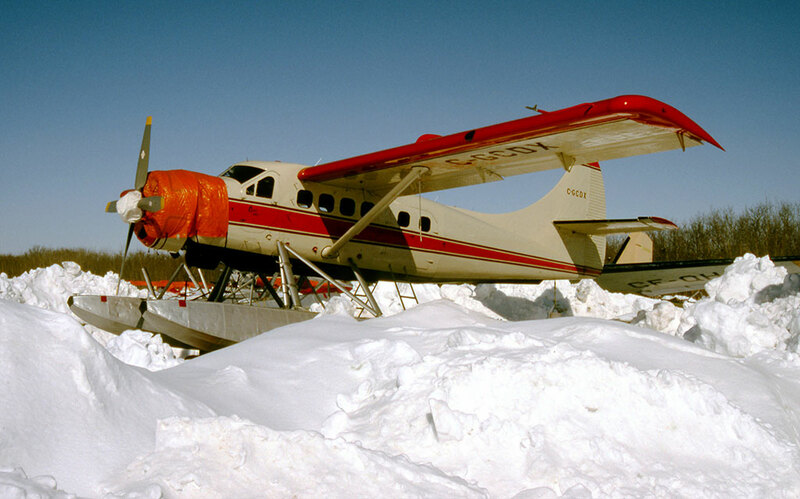 An unusual charter involving the Otter occurred in July 2006 when CDX was used to fly parts of Fokker Standard Universal G-CAJD from Charron Lake in northern Manitoba (where it had lain at the bottom of the lake since it crashed there in 1931) to Winnipeg. The entire aircraft was later recovered and put on display at the Western Canada Aviation Museum in Winnipeg. After twelve years service with Selkirk Air the Otter was sold, the buyer being Bald Mountain Air Service Inc of Homer, Alaska. The Otter was registered N413JP to its new owners and delivered from Selkirk to Homer, where it joined turbine Otter N104BM (118) with Bald Mountain A/S. It flew for the company for two years with the Polish PZL engine but during January / February 2011 it was converted to a Texas Turbine with the Garrett engine, being conversion # 39. Immediately after the conversion it headed north to Deadhorse, on the Alaskan north coast, where it was based until returning to Homer at the end of April 2011. It was noted at Anchorage on 28 April 2011 on wheel skis returning to Homer. Bald Mountain Air Service’s main base is at Homer, where its two Otters are based and available for general charter work. The company specialises in bear viewing flights for tourists during the summer months. The company has also established a Scientific Support section with a base at Deadhorse, where at least one of the Otters is to be found on wheel-skis during the winter. The Otters have the latest GPS equipment to operate in this demanding environment and are certified for IFR operations with cargo only, and VFR for passengers. On 20 March 2015 N413JP was observed on the flight tracker websites en route from Lonely, Alaska to Deadhorse. It continued flying for Bald Mountain Air Services in the years that followed.